The ultimate guide to Les Diablerets ski holidays. Lots for families, easy access from Geneva and a chocolate box village to rival the rest of the Alps are just three reasons we like this resort – and we haven’t even mentioned the three ski areas, one of which is a snow sure glacier. Despite it being oddly named after the Devil (le Diable), it’s hard to find a bad word to say about Les Diablerets. 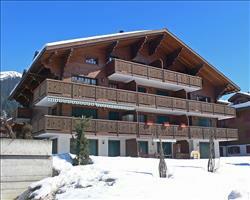 Situated in the French-speaking Vaud region of the Swiss Alps, this is one of the most accessible resorts in Europe. With a frequent train service linking to Geneva and a transfer time of just over an hour, it’s an ideal destination for all Sno lovers who want to make it to the pistes ASAP – particularly those with young children. Les Diablerets was known as ‘Le Plan des Isles’ until the townspeople got so fed up of their post being delivered to a similarly named village, that they decided to name it after a local hotel... the rest is history, and there’s lots of it: The Swiss tourist board first recognised this as a ski resort way back in 1888 and, even now, most of its buildings are traditional chalets or new constructions styled to reflect the original architecture. It’s little wonder then that the accommodation here is rated as some of the most beautiful in the world, meanwhile there’s plenty of life to be found in the ‘unspoilt’ town centre which is home to a fantastic scene of shops, bars and restaurants. The resort has the Swiss tourist board’s Families Welcome stamp for its brilliant kids’ facilities which makes it a super place to bring the clan. It’s definitely worth looking out for local discounts and offers (in previous years, they’ve given free lift pass for under 9’s) that make travelling with kids just that much easier. The village’s location is even more impressive in that it’s at the foot of three ski areas: Meilleret’s large piste network which is connected to Villars-Gryon; the south-facing Isenau slopes, and the towering Glacier 3000 – reached by the Col du Pillon cable car to the east of the village. These are all included on the area lift pass (alongside Leysin and Les Mosses) to provide a huge choice of terrain. View our detailed Les Diablerets snow forecast or snow report and see all live webcams, piste maps, road and travel maps and lift pass prices. For a picture of historic snow conditions see the snow depths month by month with our Les Diablerets snow history. The snow-sure Glacier 3000 is a great asset to Les Diabs; its runs traditionally have a much longer season between October-May and are suited to all levels – meanwhile Issenau and the slopes around Meilleret also have lots of varied terrain. Beginners can book lessons with the ESS, whose ski garden at the foot of Meilleret has a lovely gentle gradient. It’s even kitted-out with obstacles to put new skills to the test. As you progress, both Isseanau and Meilleret have beautiful blue runs which stretch right down to the village, while Leysin’s lengthy piste #1 is part of a brilliant network of blues. The red slopes around the tip of Meilleret are a fantastic playground for intermediates, with particular highlights being the panoramic Mazots Rouge and Jorasse’s exciting tree-lined descent. Take the Perche Conche ski lift to Villars where you can kick about on some lovely long runs like Chamossaire Sud and the Sodoleuvre Rouge. Floriettaz on Issenau is also great for a steep, usually sun-soaked descent, whilst the glacier’s Cabanne-Oldnegg has great views and often a wicked dusting of powder to sweep through. Tearing down the spectacular Olden slope is a particular highlight for experts. Found on the glacier, it weaves between the Oldenhorn and Sanetschhorn combe – pairing technical hairpin bends with heaps of powder. Oldnegg carries on from the bottom of Olden, giving you the chance to complete the thrilling ride to Reusch at the foot of the glacier. There’s a nice south-facing black on Issenau too and it’s also worth checking out Ruvines at Gryon for a long, sheer run through trees. Olden is accessible to freeriders after a heavy snowfall – set your alarm early so you can be the first to carve tracks through the pristine 7km combe. There are some awesome trails at Villards while Les Mosses has a boardercross route in the trees. The Monsterpark at Glacier 3000 is also incredible to session – having some massive booters and a challenging Big Mama line. The Issenau restaurant is a great place to begin the afternoon après for a warming vin chaud and stunning views before heading down to the village. If you’ve been skiing the slopes of Glacier 3000, the Rooster Bar at Reusch is worth a stop, followed by the buzzing atmosphere at L’Ormonan which is right in the town centre. Later on, most revellers tend to flock towards La Pote for its lively disco – often hosting guest DJ’s and theme nights – whilst MTB is the best spot to challenge your friends to videogames, pool or darts. The resort is home to some of the area’s best Swiss restaurants – we’ve heard great things about Auberge de la Poste from tourists and locals alike. The restaurant is in a traditional-style chalet which is conveniently located in the middle of the village, serving classic fondues as well as amazing Swiss hot chocolates. The Chalet Lacroix is also impressive and does a range of authentic and exotic dishes, whilst the menu at family-run La Grange includes some fantastic Italian favourites. Other things to do include skating on the outdoor ice rink; the Fun Park on Meilleret has its own sledge run and there’s even the option of husky rides on the glacier. Non-skiers can browse the village’s craft and souvenir shops or head up to the mountain for its walks and snowshoe trails. When is the best time to ski Les Diablerets? The ski area includes pistes that face in all directions, with some terrific higher-altitude skiing in the Issenau region, making it a great destination throughout the season. In poor visibility, shady runs through trees can be found mostly towards Meilleret and as the area is north-facing, it’s also your best bet for good snow as spring approaches. The glacier is usually open from November to May, which pretty much guarantees fantastic fresh snow at all times of the usual season (you just might have to take the gondola back into the village once the warmer months roll in).